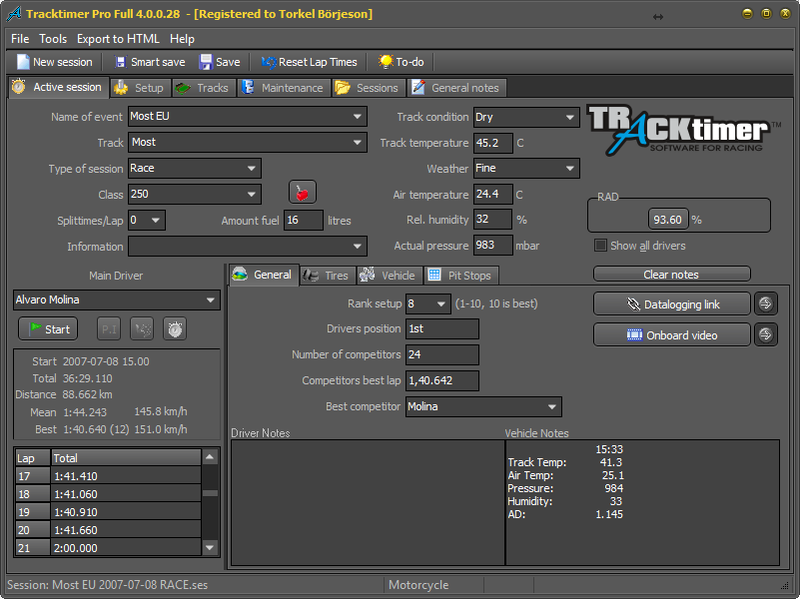 Tracktimer is available in two versions, one is called Basic and one is called Pro. The basic version is less expensive but also lacks the most advanced features. If a feature is specific for the Pro version	in the following text it will be indicated with the text Pro only. One button/key controls the stopwatch. 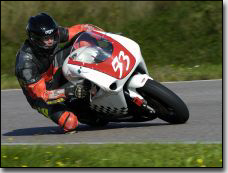 Unlimited number of split times when lapping times. Keeps track of best lap, average lap and optimal lap which is made up of the best split times. Possible to enter a session manually if another timing device has been used. Possible to import lap times from the following lap timers: AIMSports, AIM Light Analyzer, Alfano, Rollcentre T200, PI, Ultralap, Motec, 2D, Bullet DVR. Notes for each session including tire temperatures, tire pressures and various other temperature readings. A session or a selection of sessions can be saved as an HTML file, it looks like this. A team logotype can be choosen to appear at the upper right corner on the session page, just right-click there and locate your image file. Automatic calculation of RAD (Relative Air Density) or AD (Air Density) using formulas from Richard Shelquist, Shelquist Engineering, Longmont, Colorado, USA. Automatic calculation of amount fuel needed. After the session the consumption is calculated too. Automatic speed calculator for each gear with gear drop calculations and rev limit calculations. 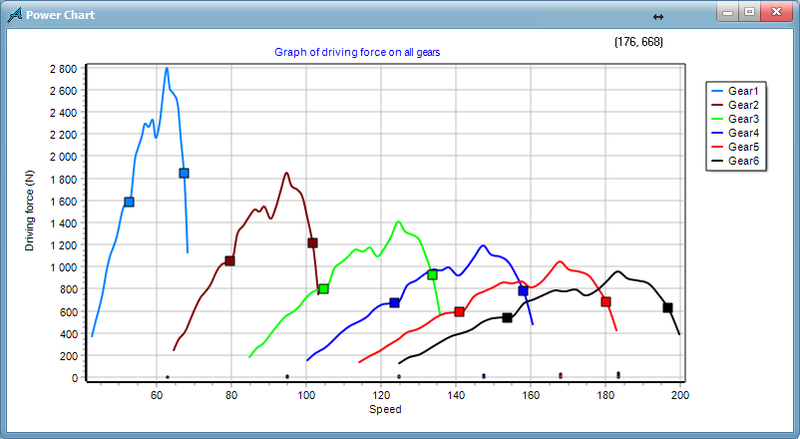 Given a dyno graph Tracktimer can tell you at what rpm you should upshift to stay on the power envelope. 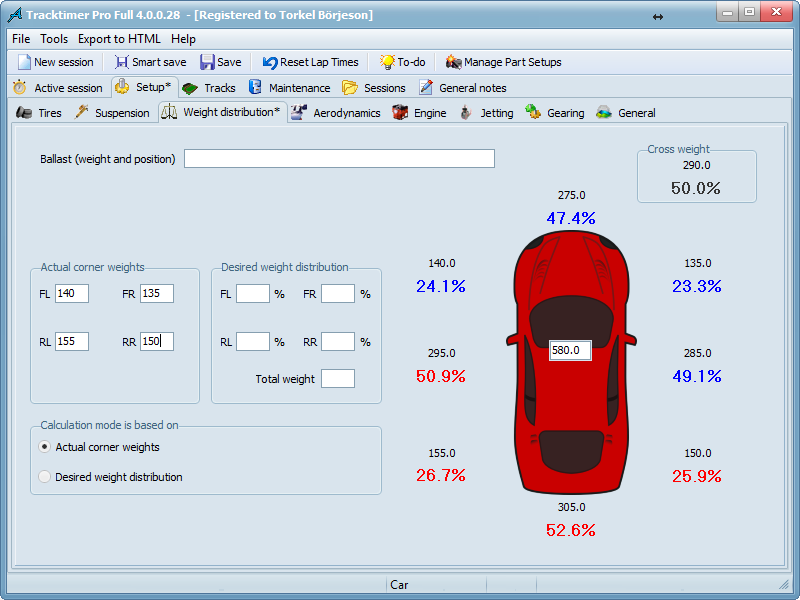 Shows a PowerChart for all gears on all speeds simultaneously. A setup can be saved as an HTML file, it looks like this. Write your own notes for each track. Detailed information about each track as well as the local organisation. 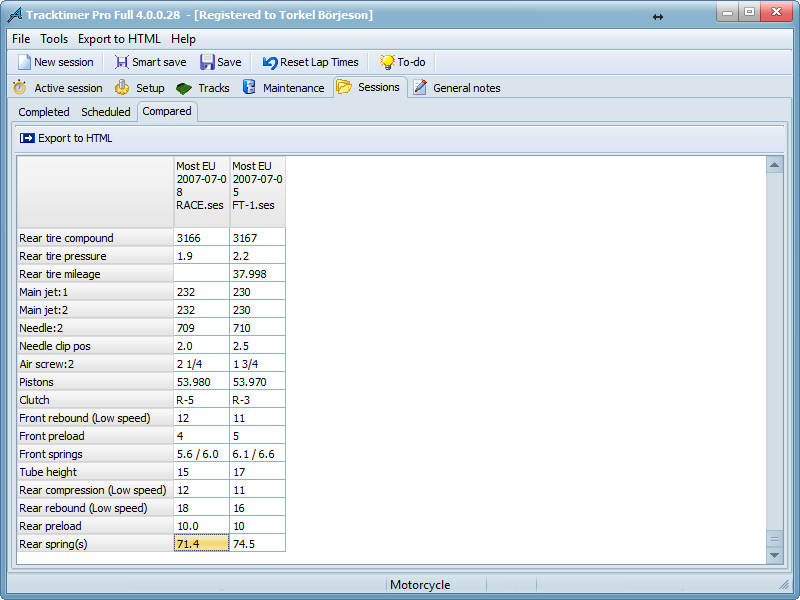 Store fuel consumption per lap for each track for fuel calculations. The tracks can be saved as HTML files, check this out! Possible to import tracks from other users and from the Tracktimer homepage. Possible to add an on-board lap for each track. Enter the scheduled events (races, training sessions) to get a good overview of the season. Possible to load only the setup for a session. You can export a selection of sessions to html-format. The best lap times for each driver is calculated automatically. The tree structure makes it easy to get an extremely good overview of all your sessions. Export sessions, setups and tracks to HTML files, only the data you have entered will be visible. The team logotype will be seen on these pages too. Examples: session , setup and tracks. Possible to change colors and fonts for	HTML reports. "Jetting Guru", a utility to suggest jet sizes based on corrected RAD/AD value. Four types of vehicles available: motorcycles, sidecars, gokarts and cars. Handles the following units: Metric, US and Imperial. Tracktimer has 30 built in "VCL styles" so you can choose the look and feel that suits you best.